While taking a road trip I like to find candy that is easy to eat in the car. For the most part, anything chocolate, anything sticky, or anything messy is off-limits. A package of orange slices with all that sugar loose in the bottom would be VERY unwelcome! Individually wrapped hard candy is one of those perfect road trip candies. Our family likes Jolly Ranchers and this flavor was new to us. There were five flavors in this bag: peach, orange, watermelon, strawberry and mixed berry. I have to admit that I rarely drink a smoothie, so I wasn't exactly sure what these would taste like. We all started with the orange, since it is one of my wife's favorite flavors, and it was really good. The orange tasted like an orange push-up or an orange creamcicle. It was fantastic. We were really excited to dig in, so I grabbed a mixed berry next. I hated it. There was something about the flavor that did not appeal to me. Okay, liking one out of two isn't bad. I moved on to the peach, hey, not bad. It had a creamy peach flavor that reminded me of eating peaches and cream or fresh peaches and ice cream. I really liked this one. I didn't understand the watermelon smoothie flavor, is that even possible to make? Wouldn't watermelon turn to water if blended? This one was really good too. It had a nice watermelon Jolly Rancher flavor yet had a hint of cream or ice cream thrown in. The cream flavor wasn't as noticeable in this flavor. Last up was the strawberry and the flavor on this one was pretty good too. Not as great as orange or peach, but still really good. Don't let the color of these scare you away. They are not the normal see through or semi-transparent Jolly Rancher looking candies. 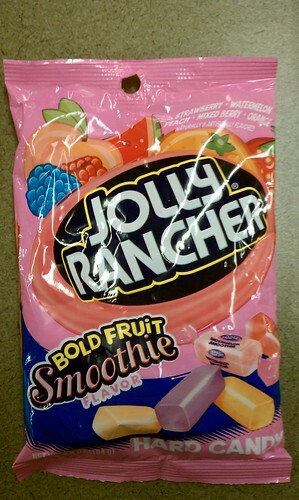 These are milky and opaque, but I think that's the point since they are "smoothie" Jolly Ranchers. I thought these were fantastic (minus the mixed berry) and they didn't last long in our car. We ate them so quickly we thew the bag away without getting any nutritional information from them. We also did not take a picture of the individual pieces! They really were that good. If I see this again somewhere, they are a MUST BUY for me. An orange creamcicle jolly rancher sounds pretty good. And i agree when I think smoothie I don't think watermelon. I thought watermelon was usually reserved for slushes.